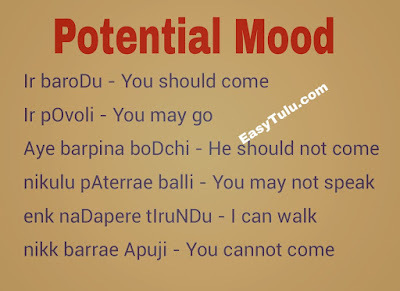 Today we are going to learn Potential mood in Tulu. Potential mood is used to express ability, permission, obligation, expectation or necessity of an action. Examples: He should come, You may go, He can write etc. The suffix ‘oDu’ is derived from the modal verb ‘bODu’ which means ‘want’ or ‘need’. In English ‘may’ is also used to express probability. But in Tulu we have Uncertain Future Tense to express probability. The third person neuter present tense/future tense/past tense form of the verbs ‘tIruni’ (To be able) and ‘Apini’ (To become) are used with infinitives (second form). Lets us now make some sentences in potential mood. English: All people need to unite. English: Should I go or not? English: What should I do? English: May I come in? English: May I come with you? Kannada: nAnu ninna jate barabahuda? Tulu: enk onji sAya malpoliya? English: Can you do me a favor? Kannada: nanage ondu sahAya maDabahuda? Tulu: yAn ulai baryere balliya? English: Am I not allowed to come in? English: You are able to run faster than a horse. Tulu: namak I bElae malperae tIruva? English: Will we be able to do this work? Kannada: namage I kelasa mADalu AdIta? Tulu: nikk kANDae bEga lakkerae ANDa? English: Were you able to get up early in the morning? Kannada: ninage beLagge bEga ELOke Ayta? Today we are going to learn something very easy i.e. Interrogative and Indefinite Pronouns. We have already learned Subjective (Personal) pronouns in the lesson 2. Declensions of these pronouns are same as Subjective (Personal) Pronouns. But these pronouns are used in only some cases. Tulu: ninna pudar dAda (or enchina)? Tulu: I dAda bElae malpuni? English: What job do you do? Kannada: nInu Enu kelasa mADuvudu? English: Why did you come? 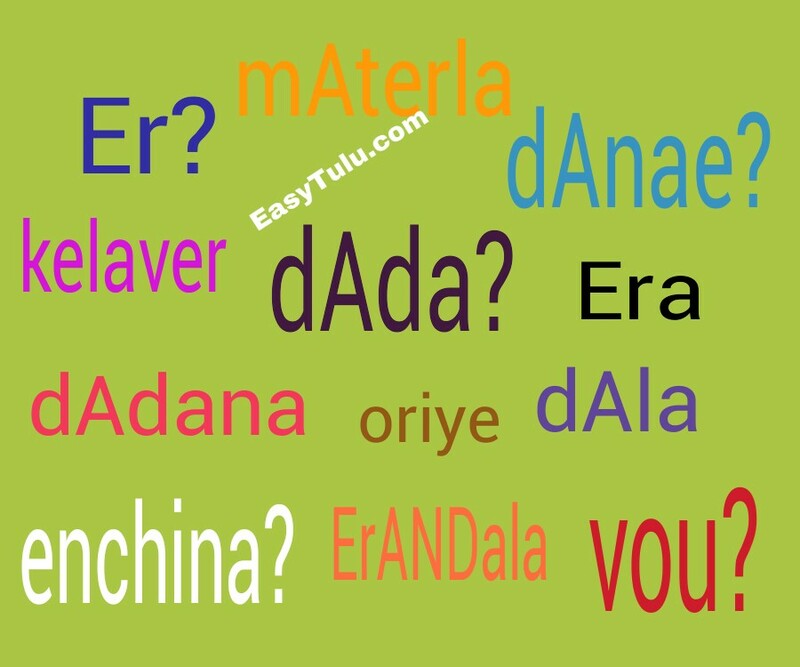 The word ‘dAnae’ can give different meaning when used in different situations. In the above example it gives the meaning of ‘why’ or ‘for what purpose’. It can also be used to express greetings when people meet one another. 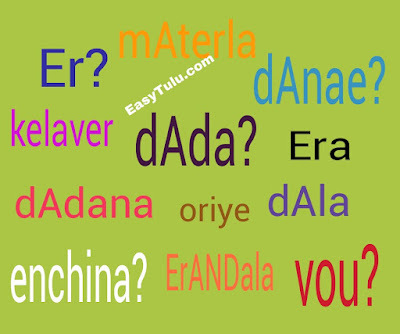 English: Hello, How are you? Tulu: I kathen Er baretini? English: Who has written this story? English: Whose house is this? English: With whom did you tell? Tulu: I raDD angileD nikk vou Avu? English: Which one do you chose from these two shirts? Kannada: I eraDu angigaLalli ninage yAvudu AdItu? Tulu: nikk dAla paNDrae (paNyerae) uNDa? English: Do you have anything to say? Kannada: ninage EnAdarU hELalikke ideya? English: Don’t fear, nothing will happen! English: Something has happened to him. Now we are going to learn these types of sentences in Tulu. First person plural imperatives are used mainly for suggesting an action to be performed together by the speaker and the listener. 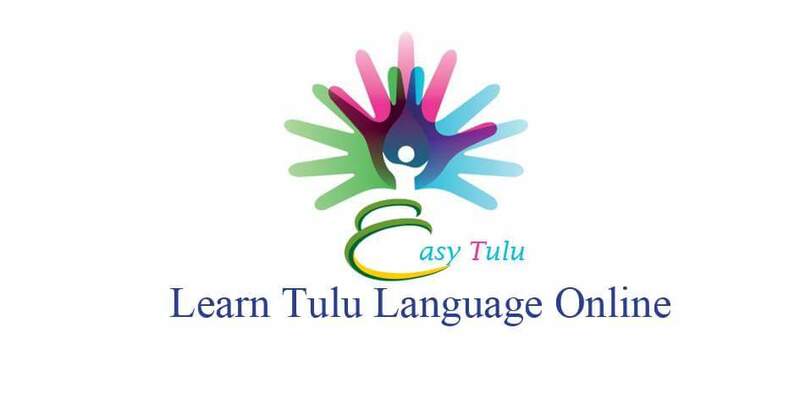 Tulu does not have imperative forms for the first person singular ‘yAn’. Only ‘nama’ has imperative form in Tulu. The verb ‘pO’ is irregular. The imperative form ‘pOyi’ is used more frequently compared to ‘pOka’. Tulu: nama ini movie’g pOya? English: Let’s go to movie today? Kannada: nAvu ivattu movie’ge hOgONva? English: Let us have tea or not? 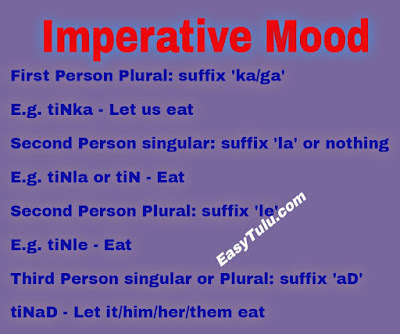 There is no negative imperative form for the first persons in Tulu, but this can be expressed by using the negative gerund with imperative forms of the verb ‘uppu’. Second Person imperatives are used for ordering, requesting or advising the listener to do something and to express a wish. Usually the root verb itself is the imperative form for the second person singular. We can add the suffix ‘la’ optionally to the root verb. However, adding the suffix ‘la’ is mandatory for the verbs with single syllable like tU, dI, mI, rA, A, sai (except pO) to make second person singular imperative forms. The verb ‘bar’ is irregular. To make second person plural imperative forms, the suffix ‘le’ is added to root verbs. Imperative forms can be used in a variety of ways depending on the persons you are addressing. To make negative imperative forms for the second persons, add the suffix ‘aDa’ (singular) or ‘aDe’ (plural) to root verbs. Third person imperatives are used to suggest or order that third parties be permitted to do something and to express a wish. To make third person imperative forms (both singular and plural), the suffix ‘aD’ is added to root verbs. English: You wash the dishes, let him wash the clothes. English: Let him go now? 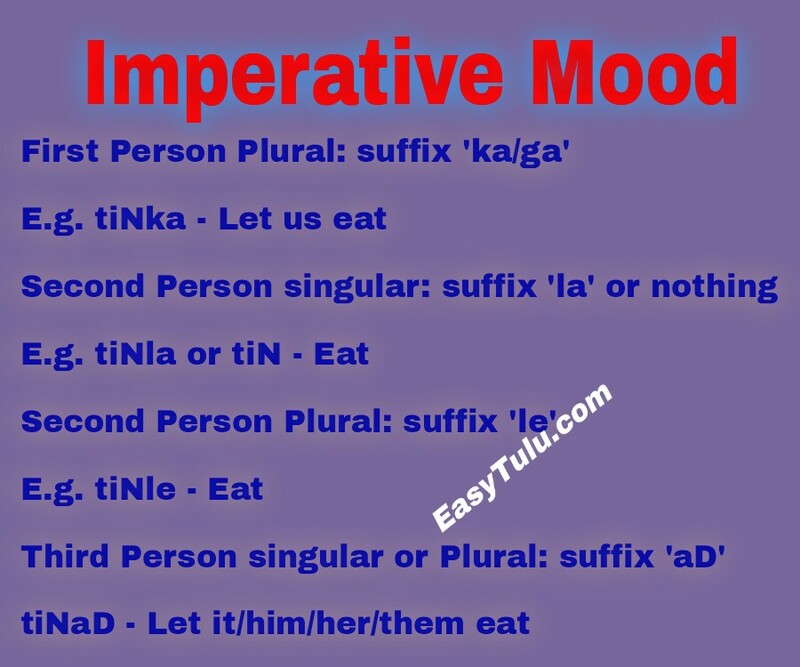 There is no negative imperative form for the third persons in Tulu, but this can be expressed by using the negative gerund with imperative forms of the verb ‘uppu’. Today we are going to learn one more verbal which is called Infinitives. 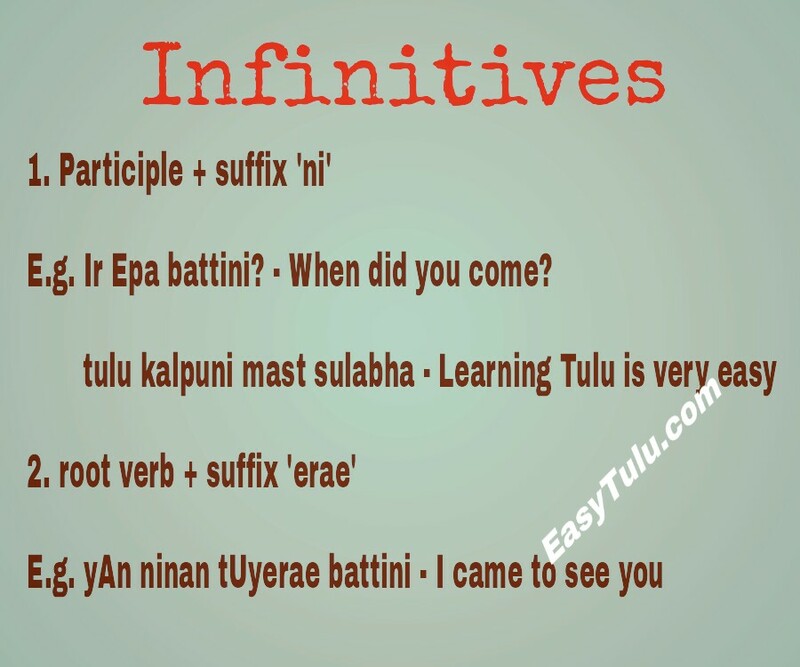 There are two infinitives in Tulu. The first form is formed by adding the suffix ‘ni’. The second is formed by the suffix ‘erae’. First Infinitive: Suffix ‘ni’ (also we can see ‘na’ or ‘ne’ in some dialects). The suffix ‘ni’ is added to participles. This form is generally used instead of personal forms of verbs in questions or answering questions or when emphasizing the action (verb). In the above example, we already know someone has come, but we don’t know who it is. So we are emphasizing the verb ‘came’ in the sentence. I don’t think we have certain rules on using infinitives instead of personal forms of verbs in Tulu, but it works as same as Kannada or other Dravidian languages. English: Who did not come? English: They came yesterday and will go today. This form is used same as ‘to + verb’ in English. Sometimes the dative case suffix ‘g’ is used with this form optionally. Tulu: nikk malparae dAla bElae ijja? English: Don’t you have anything to do? Kannada: ningae mADalikke EnU kelasa ilva? Tulu: ireg tiNDrae (tiNyarae) dAla bODe? English: Do you want anything to eat? Kannada: nimage tinnalikke EnAdrU bEka? ‘bODu’ is a modal verb in Tulu which means ‘want’, ‘need’. Its opposite is ‘boDchi’ which means ‘not wanted’, ‘need not’. Enlglish: Do you want tea?